Show me the green | Guten Morgen Berlin! January 26, 2014 January 11, 2015 - Guten Morgen Berlin! Whoever first had the idea to sell small bunches of herbs in the supermarket was a wily genius. Portioned herbs have got to have the highest profit margin of all the world’s commodities; sure, gold is expensive per gram, but presumably less expensive than the 1.60€ one is expected to pay for three small leaves held together by the world’s smallest elastic band. Plus, gold doesn’t then wilt into inedible sinews just hours after it has been taken home from the shop. German and English supermarkets share this one depressing attribute: all herbs are sold at a heart-stoppingly high markup, packaged in an oversized plastic sarcophagus. It does seem especially cruel in Germany, though, because these are a people who truly love and respect the art of the noble herb. Herbs play a huge part in the cuisine and the culture over here. From herbal tea (mmm, ok) to herbal remedies (hmm…) they are given the credence they deserve, and anyone with a balcony is essentially a social pariah unless they festoon said balcony with huge bushes of aromatic foliage. Along with bakeries and ‘apothecaries’, there are equally astounding numbers of florists’ scattered along every street, and in every one, amidst the bouquets and the decorative bamboo and the slightly strange wreaths made out of spraypainted lichen, there are always herb plants – interesting and nice herb plants – ready to be taken home and goaded along the rails of a balcony somewhere. It is a joy. A cup of German herbal tea is nothing like the green-tea-bitterness that one usually encounters in the UK. It is actual real herbs steeped in hot water, and at the best cafés that means a hearty bunch of sage, rosemary, thyme, mint and all sorts in a big hot fragrant vat. It can be quite disarming if you have grown up in a household with English roast dinners; while it certainly tastes healthful and fresh, it is also inescapably like drinking a cup of very bland gravy. Of course, if you know the right times and the right places, your access to herbs is joyful and unfettered. In summer, at the start of gherkin season (don’t be ridiculous, of course there’s a gherkin season, you philistine) supermarkets sell vast bunches of dill – for the picklin’ – even including the big yellow polleny flowerheads. The view alone of such a vibrant and pert crop in amongst the usual fruit and veg is something wonderful and exciting, and something you just don’t get in the UK. Nor are the enormous sheaths of herbs you can buy at the Turkish markets, where you will find a bundle of coriander the size of a newborn baby for fifty cents and a cheeky wink. And at the Potsdam Castle there is even a whole planted border where glossy bushes of basil form the central foliage in a bed that margins the front of one of the most spectacular custard-coloured buildings (although naturally one is discouraged from picking the bedding plants and making a quick pesto). Anyhew, this all comes around to two recipes which evolved out of a pack of sage I bought last week. Unfortunately I was forced to go to Real to buy it – a supermarket which prides itself on stocking everything you could ever possibly need and which surgically extracts painful wads of cash out of your wallet for the privilege. Having invested in my tiny coffin of priceless leaves, I used a few to make a fancy dinner for my neighbours, and the couple of sprigs I had left over just seemed far too valuable, and simply had to become the centrepiece of all my cooking for the days to come until I had savoured every last cell of their tasty foliage. Strongly herbed, piping and toasty; this is perfect winter fodder. And boy, do we need it over here; it’s hovered around -11ºC for long enough that this morning a quick walk to my workmate’s house became an interesting voyage of discovery where I learnt that one’s gums and eyelids can go perceptibly numb in strong cold winds. I hope you make both of these comforting treats this week and enjoy them with my favourite winter remedy of all: a giant glass of lip-smacking red wine. Vegetarians suffer under the constant tyranny of stuffed vegetables. If it isn’t goat’s cheese or spinach and ricotta, the one thing any vegetarian will invariably be presented with at a restaurant or dinner party is a stuffed something. Not a bad thing, but gets a little old. 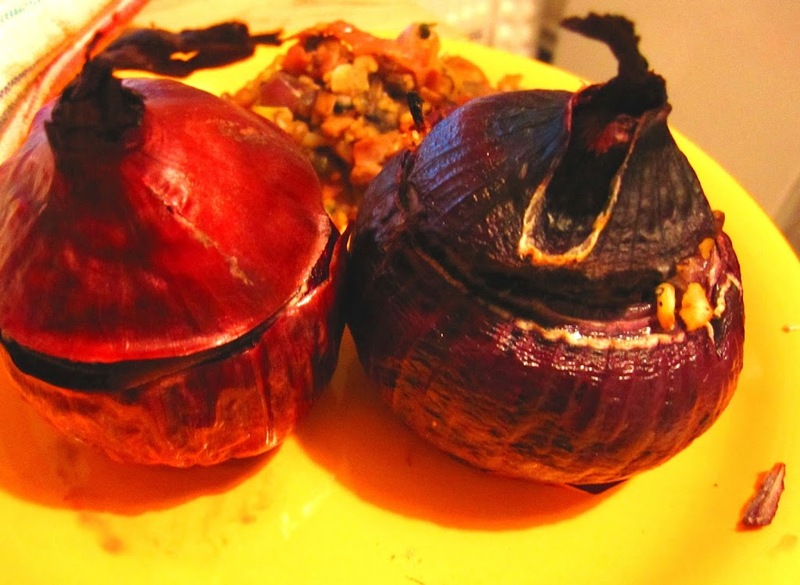 This is a slightly more unusual variant, though, and the shiny purple skins of the onions makes it a bit of a showstopper too.In short: yummy. Makes enough for one tasty dinner; multiply quantities depending on how many mouths there are to feed, you popular rascal, you. 1. Slice a small amount off the bottom of the onions so they will stand up on a baking sheet without rolling all over the place. Cut a substantial ‘lid’ off the top of the onions. Leave the skin on. 2. With the aid of a small knife and a sharp teaspoon, dig away at the interior of the onions until you have a substantial hole inside each one, with about 2-3 layers of onion making the thickness of the walls. Drizzle a bit of olly oil into each onion and pop into the oven for 10 minutes. 3. Chop up the onion you have excavated along with the mushrooms and the garlic, then sauté in a little butter or oil in a small pan for 5 minutes until the mushrooms have softened and the onion is cooked through. Add the couscous, herbs, papper and parmesan and stir to combine. 4. Take the par-cooked onions out of the oven and fill with the stuffing, then pop the lids on top and bake for 25-30 minutes. (You can pop the leftover stuffing back on the hob in the saucepan and add water, bit by bit, until the couscous is soft, and then serve the onions on a bed of this extra deliciousness). 5. Take the onions out of the oven and serve with veg and a baked potato. Remember, don’t eat the skins! This soup is one of the best things I have ever done with an hour of my life. It is stonkingly delicious and good for you. Yes, you really do need the cream. No, you won’t regret it. no potatoes. Seriously, no potatoes. They have no place in any good soup. 1. Chop the mushrooms, onions, celeriac and carrot into small dice, and finely chop the garlic. Sweat everything but the mushrooms in olive oil over a low heat. 2. Add the mushrooms (and the bacon if you are using it) and sprinkle the flour over the top. Continue to stir and cook over low heat until the mushrooms are softened. 3. Add the dried mushrooms, sage leaves (whole) and stock. Simmer very gently for a further 15 minutes until the celeriac and carrot are thoroughly cooked through. 4. Stir in the cream (add more if you need – it should have a soft, velvety feel to the broth but shouldn’t be over-rich) and add salt and pepper to taste. Make sure the soup is piping hot and serve. If you are a winner, you will have remembered an old lump of baguette in the cupboard and made garlicky croutons. I didn’t have any baguette but it was still good with crackers and cheese.